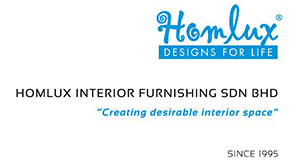 Homlux Interior Furnishing Sdn Bhd is a dedicated one-stop centre that provides our clients with a comprehensive interior furnishing solution. Whether commercial or residential areas, we offer professional consultations and top-level workmanship through our combined expertise and decades of experience. We are always working closely with our clients to ensure that all interior furnishing projects are achieved with satisfying results. 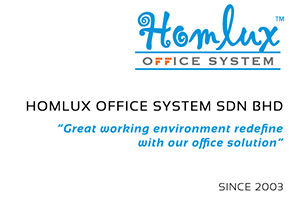 From Auditorium and Link Chairs to Workstations, Homlux Office System Sdn Bhd offers an extensive range of office-system products for different kind of office requirements. Be it large, small or limited office space, we have a dedicated team of qualified and professionally-trained staff to help you plan and create an ideal, yet functional working environment. Regardless of budget, we ensure that our products and services are met with the highest quality possible to satisfy our client's need and expectations. Curtains play an important role in your home. They can either enhance or subdue the overall environment of your living space. At Homlux Windows Covering Sdn Bhd, we offer a wide range of classic and modern styles with fabrics made suitable for all walks of life. From formal styles to the current trend of curtain designs, we have a range to fit your character, personality and preference. "Where form and function gives you more than window dressing" There's an old saying "the eyes are the windows to the soul". 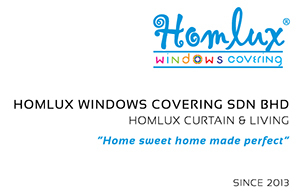 At Homlux Windows Covering Sdn Bhd, we adhere to the timeless philosophy with our specialized variety of window-covering materials that match different kind of styles, tastes and budgets for your home.